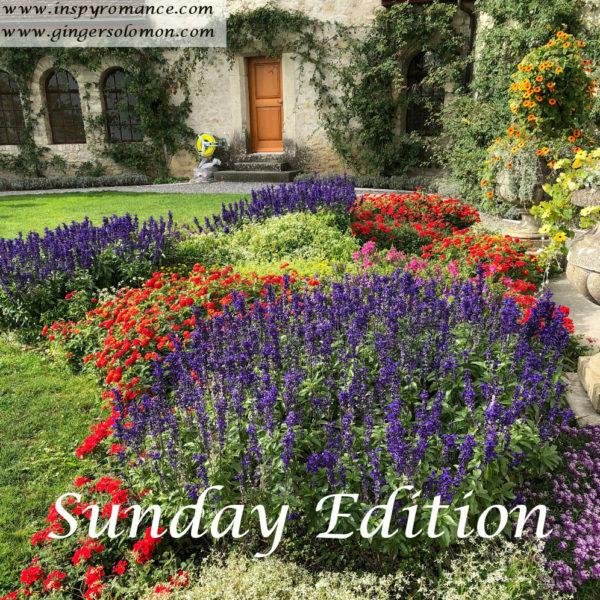 Well, ladies (and gents, if we have any male readers), this is my last Sunday Edition for 2018. It’s been fun showing you a few of my pictures from my trip to Switzerland. The above picture was from one of the castles I visited. I teased my husband and told him that I’d gone to Switzerland to take pictures of flowers. :) I almost always come back from my trips to wherever with at least one or two, but more like ten or twenty. I just love flowers. I prefer roses, but these (whatever they are) are pretty. Just to the left of this picture is a little seating area outside of the cafe where I lunched. This picture may actually show up on a cover some day, because I love it so much. Doesn’t it look romantic? The winner of Valerie Comer’s post is Tracey Hagwood. Kimberly Bowie is the winner of Autumn Macarthur’s giveaway on her post. The Wedding List by Autumn Macarthur is free 11/25-11/29. Valerie Comer’s The Riverbend Romances 1-5 is on sale for $3.99 11/25-11/29. Ginger Solomon’s Broken Holidays Series is on sale for $2.99 11/25-11/29. A Devon Park Novella Collection 1-4 by Lindi Peterson is on sale for $3.99 11/25-11/29. The Monarchies of Belles Montagnes, Compilation 2: Mevendia & Ravenzario by Carol Moncado is on sale for $4.99 11/25-11/29. Jackie Castle’s Find Love in Madison Creek (3 novellas) is on sale for $3.99 11/25-11/29. Marion Ueckermann’s Seven Suitors for Seven Sisters is on sale for $4.99 11/25-11/29. Serenity Landing Second Chances Compilation by Carol Moncado is on sale for $4.99 11/25-11/29. A Farm Fresh Romance 1-3 by Valerie Comer is on sale for $2.99 11/25-11/29. Autumn Macarthur’s Come to the Lake (Huckleberry Lake 1-3) is on sale for $2.99 11/25-11/29. Carol Moncado’s The Monarchies of Belles Montagnes, Compilation 1: Montevaro is on sale for $2.99 11/25-11/29. Fall in Love at the Miss Snowflake Pageant (Christmas in Montana 1-3) by Valerie Comer is on sale for $3.99 11/25-11/29. London Loves by Autumn Macarthur is on sale for $2.99 11/25-11/29. Hi Ginger, looks like a beautiful place to sit and enjoy a meal. Imagine living in a castle with gardens like that…and a gardener to do the weeding!! I’m off on a school camp for a couple days- hopefully the weather is friendly to us! It would be nice to have a lovely garden like that, as long as I didn’t have to weed it. Thanks so much for sharing your trip with us! I love getting to “travel” this way! Thanks Valerie and Inspy Romance! I’m happy to be a winner! Congrats to the winners! Love your photos, Ginger…..thanks for sharing! Hi Ginger! Love relaxing with a good book, a cup of tea in a beautiful colorful garden. Best wishes. Thanks for sharing. Enjoy your Sunday and the holiday season. Best wishes. Lovely photo! It looks a wonderful place to visit. Thanks, Autumn. I love to look at flowers but have never taken the time to learn their names. One day. Maybe. Beautiful photo Ginger! Have a blessed Sunday! Love the fowers. Wish our soil was conducive fir planting something. We have periwinkle and elfin thyme out front by the rocks under our front window along with hens and chicks. But we mostly plant in containers. Our porch is bare now. Plant what works, Paula. Thankfully, everywhere I’ve lived supports the rose plants I love so much. :) I plant them every time I move. Thanks for sharing this pretty flowers with us! Very pretty picture, Ginger. I love flowers too. But not in my yard so much. I lived in an old house when we first got married. The lady who’d lived there before was a widow and she’d planted flowerbeds all over the place. I pulled weeds and hoed weeds for one spring and summer. The next year, I put the lawnmower in the beds and mowed them all down. I only have flowering trees and bushes where we live now. My mom has flowerbeds all over her yard and enjoys tending to them. They’re pretty. As long as she does the tending and not me. I hate weeding too. I’m about to take out two of the flower beds in my yard. They get too overgrown and look hideous. Our house has a large footprint, but I’m contenting myself with bushes mostly. I transplant my roses to a smaller area so it will be easier to care for them. I would love to visit Switzerland. Looking forward to the pictures.